The Acanthaster planci (‘crown of thorns starfish’) is a non-invasive, naturally occurring pest that inhabits coral reefs. They are corallivores, covered in long poisonous spines that range from purplish-blue to reddish grey to green. COTS typically feed on fast-growing Acropora corals (branching & table- allowing for slower growing species such as massive corals to grow). However, in cases where there is a low coral cover of these coral species due to an abundance of COTS, they may eat other corals such as Porites or foliose. Other than hard corals, they also feed on algae, sponges and soft corals. 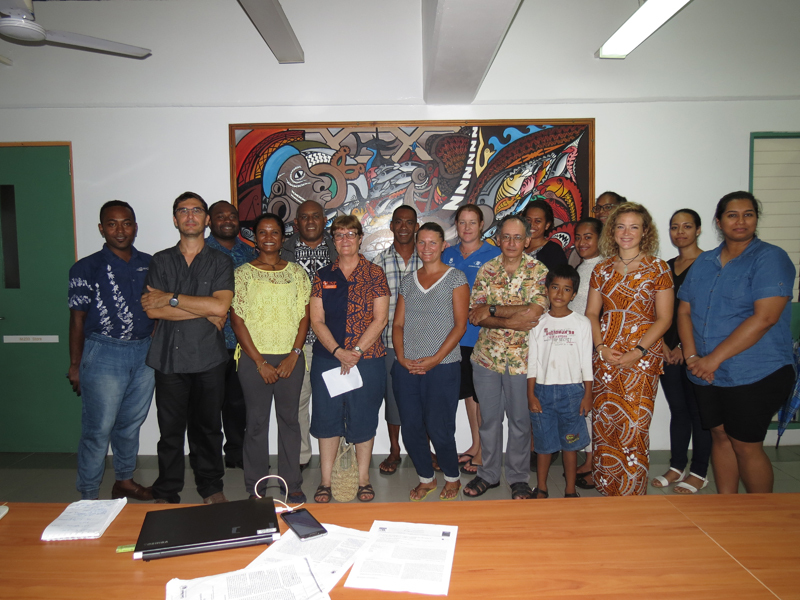 The Pacific Centre for Environment & Sustainable Development and French National Research Institute for Sustainable Development organised a 1-day workshop at the University of the South Pacific Marine Institute on the 21st of November, 2017. The Mamanuca Environment Society was privileged to attend this one-day event titled: “The Crown-of-thorns Issue in Fiji: Challenges & Perspectives”. According to the facilitators, “Crown of thorns starfish are broadcast spawners, i.e. they reproduce externally and occur in low densities. However, they can dramatically increase during certain periods”. A COTS outbreak would typically show signs of more than 15 individuals located within a reef area of 1 ha (10,000 square meters) and can reduce coral cover to less than 1%. To date, the cause of outbreaks is not entirely determined although we do know they breed once a year and during this breeding season, they are capable of releasing up to 60 million eggs. Behavioural and reproductive data on cots by the scientific community has allowed us to understand this species more and with this information identify ways to closely monitor and eradicate them. Coral Monitoring can be shared in the OREANET Fiji database and have been used by the institution to eradicate COTS in project sites around Vanuatu and New Caledonia and have been proven effective. We mainly use steel rods to remove COT’s manually, but there are other useful ways we learned from this workshop that we use to remove these dangerous marine species said Lusiana, the MES project officer. The Mamanuca Environment Society hopes to continue its partnership with the research institute and work more closely with its member resorts in trying to address this recurring issue in the Mamanuca region.